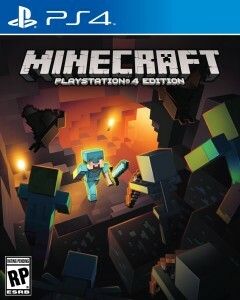 Minecraft PS4 is the PS4 platform version of the hugely popular Minecraft game, which is a sandbox construction game developed by Markus Persson. “Sandbox” means that the game map is not limited by any boundaries, it is “Open world” and “free-roaming”, even more, in sandbox game, players are free to crate their own structures. Players in Minecraft can build various types of structures in 3D environment. The game has already realised also on PC, Xbox 360, and PS3, and has been massively popular, selling over 54 million copies by the end of June 2014, and becoming one of the best selling titles in the history of video games. The next after PS4 is scheduled release on Vita, in fact, the release on all three Sony platforms, PS3, Ps4, and Vita, was announced during Gamescom 2013, in Cologne, Germany.